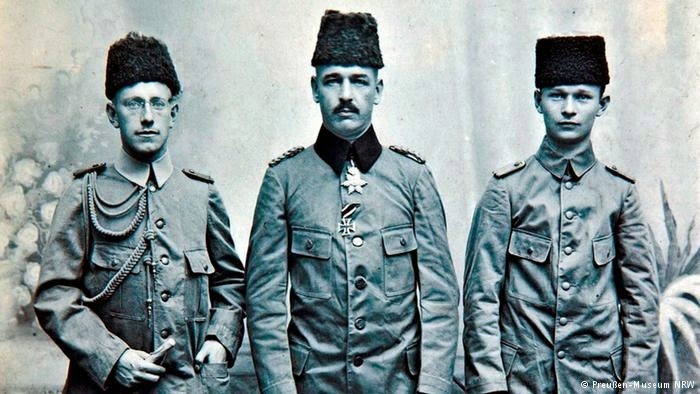 This Link has few images taken by a group of German military officers led by Captain Fritz Klein whom were sent to fight the British in Iraq and Persia with the aid of Ottomans in order stop the Anglo-Persian oil company's operation. Captain Klein originally was a military officer working in the German embassy in Persia. Before the start of the war, he was called back home. Klein was fluent in Persian and was deeply fascinated by Persia, which resulted in his disagreements with the Ottoman plan to invade the western parts of Persia. His main aim was to create a popular uprising against the British in both Persia and Iraq. He even traveled to the City of Karbala to meet with few important Shiite leaders to gain their support. At the end, Captain Klien was unable to gain a victory. After a major ottoman failure against the British, he left the area back to his homeland with the remaining Germans. To learn more about the history of Germans in Persia you could look at this article in Encyclopedia Iranica: .